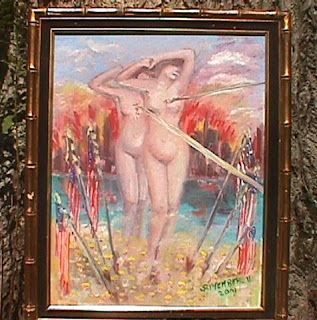 Both of the painings I had submitted for the Princeton Art Society's Farm/Art Day sold at auction for the asking price..... They were both bought by the owner of the farm. Logging started in our woodlot and there is no way we can stop it now. If they had only started way in back, but they began in my enchanted forest.... It will take a while before we go there again. 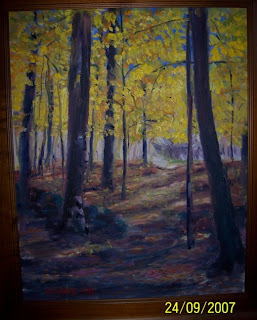 The leaves are changing and I will start to paint tall trees again. Below are a couple of paintings that were sold to a neighbor some time ago. I mentioned yesterday to my son Coert how this project has taken more out of me than I had expected. The build-up went fine but the organization of the exhibit and especially the opening, that wonderful opening, took it's toll. Added to all this excitement was the (short) visit of Peter's brother Anne and his wife Feli from Brussels. I needed a few days just to recuperate! My friend Paul Gunnerson sent some photos he had taken of the exhibit. Lets use them to close this project down. 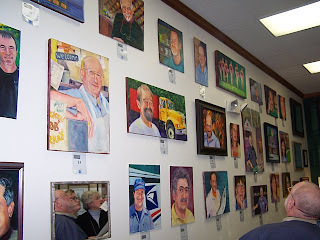 It has been a wonderful experience for me and up to now I haven't heard of anyone who did not want their portrait.... As a matter of fact most of them have been framed by Cliff before leaving the store. Mixed feelings today. 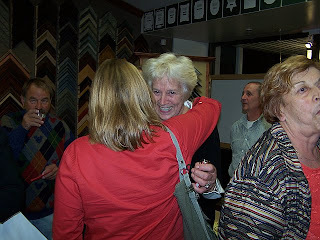 On the one hand still elated that my work was so well recieved and the opening was a success. On the other a touch of the "empty nest" because I had gotten used to looking at thirty-some portraits strewn about my studio these past months. The question arises: what's the next project? I'll need a couple of days to think about that. 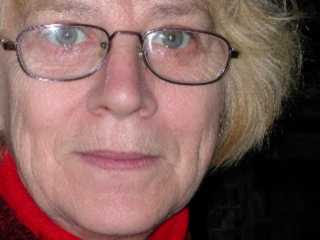 Last night I had a nice long talk on the phone with my favorite daughter in law, Dorri. We talked about pretty much everything..... coming of couse to the grandchildren Dana and Christiaan. Dorri told me that their school had posted photos of the children. Look here for Dana, hit your back button and click here for Christiaan. After Glow.... the first one. the first one we'll call "the big Hug". Yes, that's me. the second is "the wall of faces". The official photographer, Cornalijn, has posted about 100 pics in her Kodak Gallery... Try to get at it by clicking here. If this link isn't hot please let me know via the comments..... I have an account at Kodak Gallery that automatically logs me in so I'll need this feedback to keep the ball rolling. People of Tatnuck, finally the Show! I'm very very happy, all rosey.... "I couldn't sleep at all last night". The opening was a big success. Everybody came to see. Old friends, neighbors of course but also the mayor of Worcester, Ms. Konstantina Lukes. In the guestbook she wrote: "wonderful, portraits of friends and neighbors, Worcester's best assets". Another, I couldn't decifer his name, wrote: "art that makes so many people happy truly shows the joy of art". The Worcester Telegram ran an item in the local news with a picture larger than I would have expected. Try and see it here. Thanks to all the people that helped plan, cater, serve and photograph this evening was such a success. 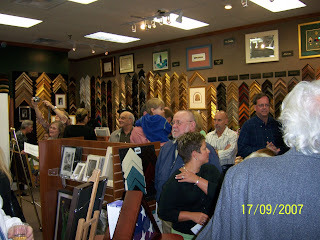 Here's a picture of the crowd that filled the store "Framed in Tatnuck". On the left you'll see my daughter, Cornalijn, working the skycam. In the middle you can just see my grandson Daniel... it was all a bit crowded for him. On the right, in the dark blue shirt, one of the two responsible for serving refreshments. Kenny Day.... with his hands empty! The second of many to follow is of Mr. Gunnerson, president of the Tatnuck Association, sitting right in the middle of Tatnuck Square. There will be more in the days to come..... We'll call it the After Glow. I decided not go to farm/art day today, because it rained all morning. In the afternoon I did not want to go anymore. My friend Jean did'nt go either, that made me feel a little better. Today there was a big article in the paper about it and that made me feel a little bad again but I'm over it. I did bring the two paintings, nicely framed, so what more do they want. Today is the big day. My exhibit, the People of Tatnuck (renamed by others "Characters of Tatnuck") will be opening this evening . Tomorrow or Wednesday I'll post pics, links and the whole article. Make sure to check back often, maybe even bookmark! You can look at previous posts by clicking on the titles in the frame on the right. It has often been suggested that I should do more to promote the sale of my work. The truth of the matter is that most of what I want to sell has been sold, although there are still a number of unique urns in my barn and paintings in my studio. My primary motivation, as stated in my profile, is "art for the art of it". But hey, you want me to paint something for you? Let me know. I work on commission and a 3 x 5 inch, or 9 x 15 cm photo is all I need if the subject for whatever reason can't sit in my studio. An old photo, a new one or one of your house, whatever. If you see something you like on these pages, again, let me know we can talk. The clock is running, excitement is mounting and the preperations for the opening are well underway. We expect at least 100 people for the opening of the weeklong exhibit. To tell you the truth I am getting a little nervous. Maybe I should have my hair done. 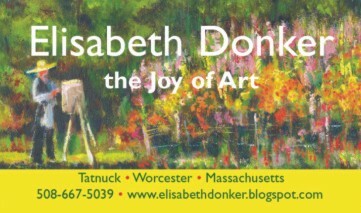 For more details about the show you can see the first "sneak preview" or see the page at Framed in Tatnuck. 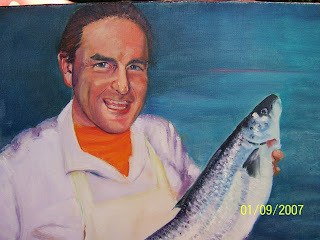 Anyway, the painting above is of Bobby Anderson, owner of the Tatnuck Fish Market. He always brings me bluefish when it is in season. 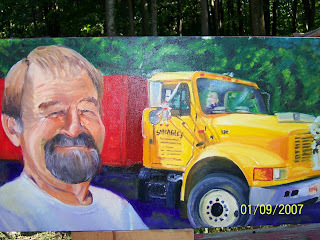 The painting below is of Mr. Smeagle in front of one if his brightly colored trucks. He's the man we call whenever we clean out our barn. September 11, 2001. I painted this with CNN on in the background. A city in flames, the twin towers pierced by flaming spears and six American flags mourning over a sea of lost and fallen fireman's helmets. This painting hangs in my home. 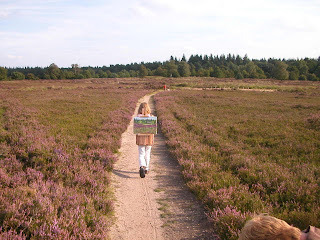 This is a photo of my granddaughter, Dana Elisabeth, carrying my paintbox through the landscape which I had just painted. The "Ermelo Heath", closeby to where my son Coert and family live in the Netherlands. Although it's already two years old it is one of my favorites.... click in the image for the big picture. On September 6th "anonymous" asked in one of the comments to see some of my ceramic work. I've been so busy organizing my People of Tatnuck exhibition that I haven't been able to get to it until now... Below are a few pictures of Worcesterware. The first is where most of the finished work is stored in our barn..... please excuse the dust. The second is of the plate I made for our own 3oth wedding anniversary in 1994. This one is hanging above a door frame in our kitchen. Back to the barn, I dusted with my sleeve the platter with Worcester's City Hall. The last is of a reading lamp in our "hearthroom". The shade is set for better reading. I hope this satifies the curiosity of those interested. Just going back into the barn, looking at these works and actually thinking about my period of Worcesterware brought back fond memories. The nights are getting colder and we've been waiting for rain..... it's time. These paintings I did last year of white pines, oaks and maples hanging in my daughter's house remind me of the colors to come. 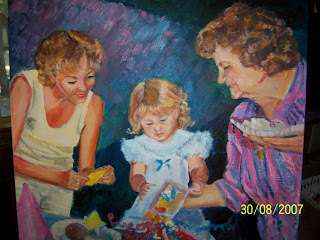 This painting of a birthday party reprsents three generations. The mother of this little girl is the one who asked me to paint this from a 3x5 inch foto. The great-grand mother (right), and the grandmother(left), died recently. The mother of this little girl wanted to have this moment saved in an oilpainting.